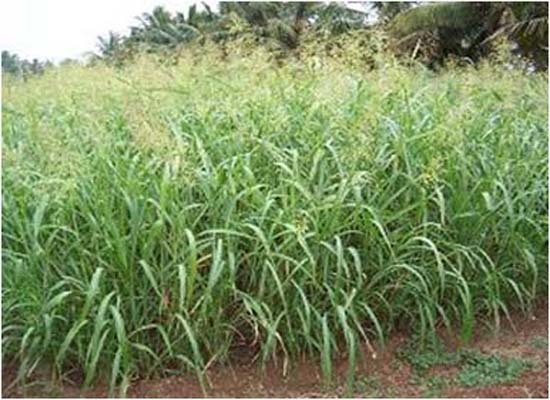 Note: Fodder Cholam can be intercropped with CO 5 and COFC 8 Cowpea at 1:1 ratio and harvested together to provide nutritious fodder. Plough with an iron plough once and with a country plough twice. Apply NPK fertilizer as per soil test recommendation. If soil test is not done, follow the blanket recommendation of 60 : 40 : 20 kg N, P and K /ha. Apply half the dose of N and full dose P and K basally before sowing. For COFS 29(multicut variety) : Apply 45 : 40 : 40 kg N,P, K/ha as basal and 45 kg N as top dressing on 30 DAS followed by the application of 45 kg N/ha after every cut. After 4th cut, apply 40 kg P and 40 kg K along with 45 kg N to sustain the fodder yield and quality. Application of Azospirillum(2000g/ha) and Phosphobacterium(2000g/ha) together as a mixture or Azophos(4000g/ha) along with 75% recommended dose of N and P fertilizer enhanced the yield besides saving of 25% of fertilizer dose. * COFS 29 seed has one month seed dormancy. Irrigate immediately after sowing. Life irrigation on the third day and thereafter once in 10 days, according to need based. First hand weeding on the 20th day of sowing and if necessary 2nd hand weeding between 35 - 40 days after sowing. Apply 12.5 t/ha and incorporated in the soil at the time of last ploughing. 30 : 20: 20 kg N, P and K / ha for Alfisols (Red soil). 40 :20 kg N and P/ ha for Vertisols (Black soil). © All Rights Reserved. TNAU-2013.